View More In Misting Fans. The Lava Aire Italia Aviator X2 is a beautifully designed outdoor patio fan with advanced cool-misting technology inspired by modern day turbo jet engines that can be found in the aviation industry. The unit provides double-duty cooling employing the power of wind and water. 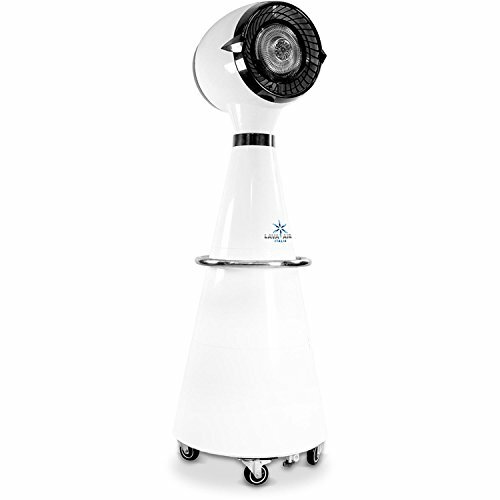 It has a compact, 15-inch diameter blade that provides serious 1700 RPM power while the centrifugal misting system further cools the air by dispersing fine misting particles throughout a 600 sq. ft. coverage area. The water tank is easy to fill and can hold up to 25 gallons of water so the Aviator X2 can quietly provide up to 16 hours of uninterrupted cooling. The entire unit is made of industrial strength anti-corrosive, anti-aging, UV-resistant materials which can withstand sustained use without compromising performance. Plus, the Aviator X2 rests on 5 commercial grade caster wheels and it can be easily maneuvered with the convenient handle. Flooring-standing electric misting fan covers 600 sq. ft. If you have any questions about this product by Lava Aire Italia, contact us by completing and submitting the form below. If you are looking for a specif part number, please include it with your message.